A criminal has been sentenced to time behind bars after he was caught by police in Chesterfield with a knife and drugs. 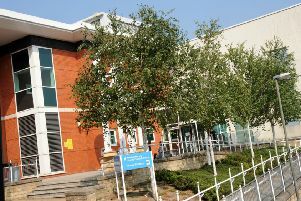 Chesterfield magistrates’ court heard om March 25 how Ashton Lattibeaudiere, 26, was approached by police on Church Street South, at Birdholme, after a tip-off about a vehicle and potential drug misuse. Pictured is Ashton Lattibeaudiere, 26, of Belgravia Close, Birmingham, who was sentenced to six months of custody after he admitted possessing a knife in a public place at Church Street South, Birdholme, Chesterfield. Prosecuting solicitor Sarah Haslam said: “The police were on a routine patrol in the Birdholme area of Chesterfield and they were told by a member of the public there was an issue with a motor vehicle and potential drugs. Mrs Haslam added that police found various weapons in the vehicle and the defendant had a small amount of cannabis worth about £10. A black, flat knife was also recovered, according to Mrs Haslam, with a finger print which was matched to Lattibeaudiere. Lattibeaudiere, who has a conviction for a similar knife offence, pleaded guilty to possessing a knife in a public place after he was approached by police in May, 2017. The defendant, of Belgravia Close, Birmingham, also admitted possessing the controlled class B drug cannabis. Defence solicitor Aftab Zahoor said the incident had involved only a small amount of 0.6grammes of residual cannabis from a previous smoke. He added that Lattibeaudiere accepted knowledge of the knife in the car but it was not found in dangerous circumstances. Magistrates sentenced Lattibeaudiere to six months of custody. He was also ordered to pay a £115 victim surcharge.